Lo and behold, the wedding season is here! And you’ve got hitched. Congratulations! Among all the preparations that are taking place right now, you must also be focusing on looking your absolute best for the ceremonies that are about to follow. But beauty isn’t exclusive to women alone. It’s an equally important day for the groom as well, and he has just as much right to look great for his wedding. It’s the 21st century after all. Now that we all agree that guys deserve their own grooming tips and advice, let the experts take over now. Dear grooms, please pay attention, for we’re not going to repeat ourselves. And you’re going to do this only once, so better do it right. This may seem stupidly obvious, but start rinsing your face at least twice a day (apart from your bathing routine). Invest in an exfoliator to apply weekly, and cleanser for daily use to give an extra glow to your skin. Don’t use hard soaps or products containing harsh chemicals for your face. They’re likely to do more harm than good, and so close to the big day, you’re better off not doing any experimentation. If you’re not in the habit of drinking water regularly, we’d advise you to start now. Use an app if it’s hard to keep track of your water intake. Water flushes out any impurities and even disease-causing bacteria, if your intake is regulated. As a result, your skin looks healthier, cleaner, and less blotchy. The golden rule of 5 litres a day is not really true, so don’t follow that blindly. In addition to the water that you get from your foods and other drinks, drink 2 litres of water and that is more than sufficient. Leading up to the big day (and probably beyond that as well), there are plenty of parties and ceremonies that you will be expected to attend. You obviously want to look your best and you should consider trimming the excess fat you’ve accumulated in the past few months. Hit the gym at least a month in advance to tone your body. Cardio and core training will be helpful in cutting down excess fat. You might also want to consider new world technologies like Coolsculpting to get rid of that extra flab in a single session. While your special someone might not mind that little fuzz on your back and chest, you might just want to invest in a laser hair reduction technique. It works very well on facial hair, especially beard shaping. You can also eliminate a unibrow and nose hair and save the photographer the trouble of having to use Photoshop. A virtually painless solution, with Laser Hair Removal, you’ll be out looking fabulous after just a few sittings with an expert. Some of you want to shed hair, and some of you want to gain it. For those who want their crowns adorned with a mop of thick hair hair, we have a few options for you. Skin Alive offers a host of hair treatments like Laser Light Therapy, Ozone Therapy, Peptide therapy, Stem Cell treatment or even PRP treatment. Step in for a consultation, and let’s find a solution to your problem. You may not have worried about the state of your nails before, but that caveman look with grubby hands, cracked cuticles, and ingrown toenails was outlawed centuries ago. File your nails, get a manicure, and moisturize properly so that your ring looks good on those oh, so elegant fingers. You’re going to smiling a lot for the camera, so make sure your pearlies are shining nice and bright. Use a whitening toothpaste to get rid of those coffee and tobacco stains or consult a dentist for professional services. For the clean shaven look, schedule a sitting with a barber right after a hot towel sauna or bath. Book a professional who gives the right lather, and knows how to use that razor according to sensitivity and growth. For the stubble, you’ll have to be a little on your toes. Why? Because unless you know your hair growth rate and what day your stubble is ideal, you’ll have to indulge in a game of trial and error. Shave/trim a few times to nail the schedule right. You can opt for Laser hair reduction for beard shaping so as to save the hassle of salon visits or shaping yourself. If you’re thinking of keeping a full-blown beard, that’s going to involve a lot of effort. Unless it’s maintained well, a beard can go horribly wrong. So, trim it regularly and invest in some products like oils and conditioners to groom the beard. Dear Grooms, yours is the day. Seize it. 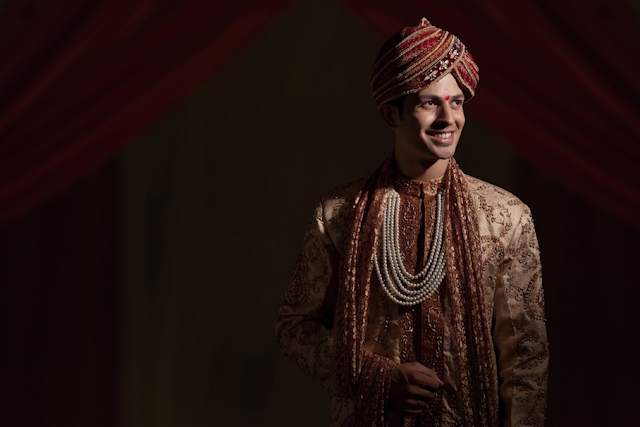 Don’t just roll out of bed and march into the shaadi ka mandap in your wedding finery. Make an impression. Let the people around you bask in your charisma and wonder what you did to look so effortlessly handsome. Ms. Anupama Arora, a Senior Consultant at Skin Alive, has nearly two decades worth of experience under her belt. With her background in nutrition, she is able to take a comprehensive and holistic approach to aesthetic dermatology. In addition to providing counselling on skin related issues, antiaging, and weight management, she also recommends diet and lifestyle changes to her clients, so that they’re able to live a more fulfilling life.